THERE are piles of wool on the floor, ready to be picked through, sorted and then packaged for sale. Chairs are scattered around, next to brooms and under equipment that hangs from the corrugated iron roof. 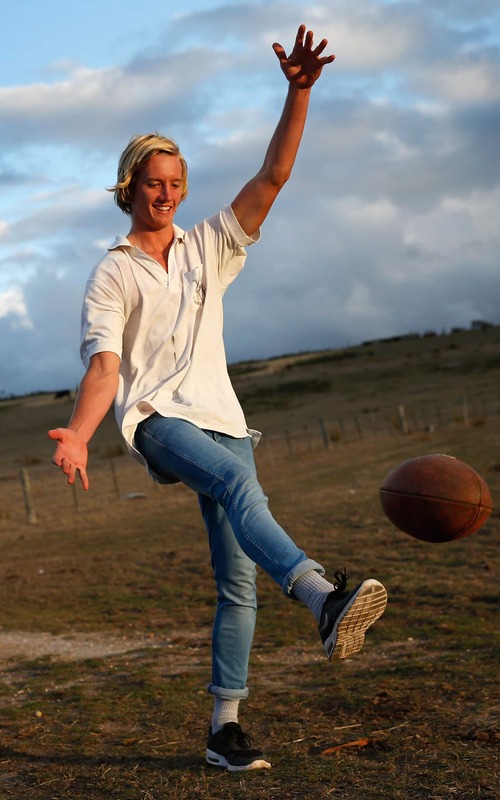 Inside a sliding wooden door and past a wall inscribed with names, notes and messages, Darcy Parish stands in the middle of his dad's shearing shed. It has been a part of the landscape on the Wensleydale property in western Victoria for nearly 100 years. It's a familiar place for Parish, a leading player in this year's draft pool, with dash, poise and skill. "I've spent a fair bit of time in here," he says. "A lot, actually." Soon, it might not be quite so much. Already, Parish looks likely to be an early pick at this year's NAB AFL Draft. As a bottom-ager last year he played five of six games for Vic Country at the under-18 championships, won All Australian selection and came second in the Geelong Falcons' best and fairest. This year promises to be more exciting, even if the 17-year-old knows more people will be focused on his progress. "Obviously I was fairly happy with last year," Parish told AFL.com.au. "There'll definitely be a few more expectations on myself this season but I have to try and avoid them and go about my own business. I try to push them aside and go about my own thing, and don't faze me too much. It's all really new to me, but hopefully the year goes along well." The early signs are good. After recovering from ankle ligament damage from the end of last year, which led to a stress fracture in his fibula after returning to training too quickly, Parish played his first proper game of the season last weekend for the Falcons. He started in the centre square, gathered 34 disposals, had nine clearances and was clearly the best player on the ground. Last year, Parish was placed on a half-back flank and given licence to create and start things. This season, he wants to use his flash and smarts in the midfield, having worked on his ball-winning over summer. On Sunday, he hopes to continue his form for the NAB AFL Academy against Werribee's VFL team at Simonds Stadium. It's one of two games the Academy will play against VFL clubs – they meet the Northern Blues the following Saturday at the MCG – and Parish hopes to use the contests to set up his draft chances. "To represent Australia at such a young age will be an honour and I'm really looking forward to getting out there," he says. "It'll be a good opportunity to impress a few people early in the year and kickstart my season." Parish's footy story starts at Winchelsea, when he played in the under-10s side as a five-year-old. He continued playing there until the under-16s, when he crossed to South Barwon to face some more competitive opposition. By that stage he had already been identified as a talent: his ability to get things moving, read the game and fight for the ball was clear at state level as an under-16. "There's not an AFL club that wouldn't know his name and wouldn't be following him closely," one recruiter said. "He's already got people interested from last year and he's certainly got some really high-quality attributes. His run and carry is very good. The origins for Parish's most appealing traits can be traced back to home. The 800-acre farm lends itself to plenty of kick-to-kick sessions, as does having three younger brothers – 15-year-old Cassidy, 14-year-old Fin and Indy, 12. Darcy can't remember not having a footy in his hands, aiming his kicks at trees, garage doors and anything that resembled a set of goal posts. "They're not the type of kids to sit inside all day and play Nintendo," says Michael Turner, Falcons regional manager. Over the past few years during school holidays, Parish has spent most of his time on the farm, helping father Glen during the busy periods. When it's shearing season, he assists in rounding up their 1000 or so sheep. He jumps on the tractor to feed the cows, and in hay season will cut the grass, let it set, rake it up and bale it into square and round bundles to offload. Glen always has a few extra pairs of hands on deck. "There's definitely a bit of extra responsibility being the oldest. I try to set a good example for them to hopefully follow," Parish says. "The others are getting to the age where dad's trying to get them to do a bit that I've been doing the past few years, but there's plenty to do out here. It keeps you busy." There are also the pets to look after: guinea pigs, roosters, horses and seven dogs. Some of the dogs are there to work with the sheep, some hunt and the rest belong to Ange, Darcy's mum. "They're the fluffy ones," Parish says. Parish will chip in this year as much he can between finishing school at Grovedale College in Geelong (there's a bus stop built outside his house to collect all the brothers for the half-hour trip every morning). "I like the space out here," he says. "You can do whatever you want out here and there's not many hassles with the neighbours because they're so far away. I love the environment and we're always doing something." Parish is prepared to be busy this year. Already he has had a club visit to interview him over his kitchen table. There's been some media interest, and after many letters, calls, texts and offers, he settled on a player agent. After establishing his promise last year, Parish is keen to back up every strong performance with another. "Last year was a good for me, but it's last year," he says. "This year's another year, and I think I'm definitely ready for it. The dream has always been to play AFL so hopefully I get the opportunity."